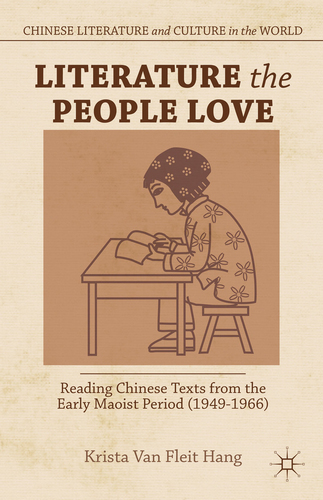 Reading Chinese Texts from the Early Maoist Period (1949-1966). New York: Palgrave Macmillan, 2013. 208 pp. Literature the People Love is a significant supplement to recent works addressing Mao-era literature and culture (both that of the “seventeen years” [1949-66] and the Cultural Revolution decade) as an appropriate subject for serious academic attention that transcends both the ruling party’s narrative of “state-bestowed liberation” and the opposing narrative of “insurmountable oppression in the communist system” (158). Van Fleit Hang presents her work as responding to cultural critic Wang Hui’s call to “achieve a new understanding of the Chinese revolution, of the legacy of socialism, and of the achievements as well as the tragedies of this legacy” (ibid). Following an introduction that briefly considers the “red classic” novel Song of Youth (Qingchun zhi ge), the book explores a series of texts or groups of texts that chart the progress of the state and its artists in creating accessible, enjoyable, and instructive works for the citizens of the People’s Republic: the first volume of the journal People’s Literature (Renmin wenxue), three variants of the story of the fictional Great Leap heroine Li Shuangshuang in different forms, the “red classic” novel Tracks in the Snowy Forest (Linhai xueyuan), two film comedies from the years following the Great Leap, and, in the conclusion, the mythology surrounding the building of the Ming Tombs Reservoir. Key to the project of creating a socialist culture for the “new China” that emerged from the civil war was constructing the “people” who would be the subjects and recipients of that culture. The word used for this purpose, renmin, largely subsumed the terms minjian (rural, folk), tongsu (middlebrow, story-teller style), and dazhong (socialist mass-style), all of which designated variants of “popular.” New journals with titles prefaced by renmin, and other cultural products of the time, instructed their readership, principally urban and educated, on what the people should be and how to attain membership. In her introduction, the author offers four defining characteristics of literature and culture in the early Maoist period: “the combination of entertainment and education, rich experimentation, the sense of mission expressed by authors, and the containment of artistic energy in the state narrative of communist liberation” (8), which are demonstrated in the chapters that follow. It is clear from the author’s reading of the first year of People’s Literature that, for all the ground rules famously laid down at the Yan’an Forum of May 1942, the creation of a new popular culture was very much a work in progress in 1949. There was an imperative to create a unified, Beijing-based culture that incorporated figures from the May Fourth era (with culture minister Mao Dun serving as editor of People’s Literature) and the Yan’an period, had a place for other writers popular before 1949, nurtured new talent, and, crucially, conscripted the ghost of a reinvented Lu Xun. Its combination of creative writing and criticism made the fledgling journal People’s Literature a “vibrant work in progress” (47); critics and readers discussed stories published in its pages with a view to defining who the people were and how they should be portrayed. Examples are given of such debates, perhaps the most valuable concerning Qin Zhaoyang’s early portrayal of the potential of a landlord for reform; after being accused of an inappropriate portrayal of class relations, Qin offered a confession, elevating a discussion that might have taken place in a small group setting in Yan’an to a “performance on a national scale” (49). Van Fleit Hang explores the theme of containment of creative energy in her reading of three of the manifestations of Li Zhun’s Li Shuangshuang: the story as it appeared in People’s Literature (1960), the film (1962), and He Youzhi’s illustrated version (1964). She dubs Li Shuangshuang a “travelling narrative” for the different forms in which it appeared. In this reading, she draws on Chen Sihe’s description of the way Li Zhun (as author and scenarist) deploys the techniques of popular rural cultural forms: in both film and illustrated versions, a wealth of detail (of housing, clothing, and farm tools) provides verisimilitude and confirms the authenticity of the story’s peasant characters. The film version is productively compared to the epic cinematic treatment given to the intellectual bildungsroman Song of Youth. In the latter, the actress playing the heroine Lin Daojing is filmed as a star; by contrast the film version of Li Shuangshuang flaunts its roots in folk culture, the characters standing for a “collective viewing subject” (78, using a term borrowed from Chris Berry). For Li Shuangshuang (as well as, it might be pointed out, for her creator) creativity must be both acknowledged by the structures of authority, and then contained and drawn into the system: the heroine’s desire to prove herself and contribute to society through physical labor must be incorporated into the Great Leap Forward and subsequent party policies to provide her with fulfillment, official approbation, and the love of her husband. Similarly, Li Zhun’s greatest creative achievement could only be recognized inasmuch as it was seen to accord with the needs of its time. Van Fleit Hang’s study of Tracks in the Snowy Forest hinges on the tension between the form of the tongsu novel and the language of class struggle. The romantic and fantastic elements of tongsu fiction, and the revenge theme and episodic structure of martial-arts or knight-errant fiction, are deployed in the service of a narrative of communist liberation, with warriors who are both prodigious heroes of the type found in earlier traditions and disciplined communists. It is, the author observes, “an uneasy fit” (105), but one she proposes is made more comfortable by the insertion into the band of brothers (a civil-war era army detachment fighting bandits and local tyrants) of the nurse Bai Ru (White Dove). White Dove’s innocence and purity contrast with the brutal qualities of the bandit harridan Butterfly Enticer, and her medical and social skills make the mission of the austere detachment leader Shao Jianbo accessible to the oppressed. She is, the chapter title proclaims, “the heart of the party,” a force for healing provided by a woman who functions among men without the loss of femininity. Tellingly, White Dove’s character, frowned on by some critics soon after the novel’s 1957 release for her romantic attachment to her commander, did not survive the transition to the operatic stage in the mid-1960s: in the yangbanxi (model theatrical work) Taking Tiger Mountain by Strategy (Zhiqu Weihushan), she is replaced by a peasant girl who is the object rather than the agent of salvation. Two warm-hearted urban film comedies by leading directors from the economically disastrous but culturally adventurous years that followed the Great Leap Forward are chosen to demonstrate “educational laughter.” These are Lu Ren’s Today’s My Day Off (Jintian wo xiuxi; 1959) and Xie Jin’s Big Li, Little Li, and Old Li (Da Li, Xiao Li, he Lao Li; 1962). With leadership authority provided by a conciliatory Zhou Enlai, the filmmakers combined humor with moral lessons, provoking “happy, joyful laughter” (125, quoting the critic Feng Mu) to emphasize themes of community and kinship in a socialist urban society. In the first film, a policeman’s good deeds on his day off are rewarded by appreciation and marriage into a worthy peasant family; in the second, workers exercise together and end up as fit and healthy as the images on the posters that inspired them, the better to contribute to modernization. Like the romance of Tracks in the Snowy Forest, the harmony of these films fell out of favor with the post-Leap return of Mao and the rhetoric of class struggle. The chapters combine to present a picture of the shaping of the people and the culture that would entertain and guide them in the 1950s and early 1960s, with a concentration on the years from 1957 to 1962. The arguments are reasoned, and the author engages with Chinese and Western scholarship to come to her own readings of the works under review. The writing is elegant and clear, and the book will be accessible to students and educated non-specialists interested in the literature, history, and culture of the Mao era. This appears to be the first volume in a series from Palgrave Macmillan on Chinese Literature and Culture in the World, edited by Ban Wang, and gets the collection off to a most encouraging start.